Erin Thorn is a retired American professional basketball player. She is currently a kids’ basketball trainer in Las Vegas. She is a member of The Church of Jesus Christ of Latter-day Saints. Thorn was born on May 19, 1981, in Orem, Utah. She played basketball for Mountain View High School, and her senior year the team finished with a number 8 national ranking in USA Today. She was widely recognized as one of the best high school players in the country. She was a four-year starter as shooting guard for the women’s basketball team at Brigham Young University. She was a star guard in 2002 when the team reached the Sweet 16 for the first time in school history. She earned her bachelor’s degree in Fitness and Wellness Management in 2003. She was drafted in 2003 by the WNBA's New York Liberty, where she played until 2008. 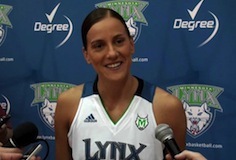 Thorn was named WNBA Eastern Conference Player of the Week for the week ending May 29, 2007. She was a free agent with Chicago Sky from 2009 to 2011, the Minnesota Lynx in 2012, and the Indiana Fever in 2013. In two offseasons, she also served as an assistant coach for BYU. Thorn also played with Panathinaikos in Greece and Tarbes GB in France in her off seasons. This page was last edited on 5 December 2015, at 21:20.